There are of course the Seven deadly sins and they do apply to ghost hunters. Did a fellow ghost hunter get the paranomal EVP you'd been waiting for? Did your colleague surpass you -- again -- in getting in touch with the dead via a Franks Box? You should absolutely acknowledge others' achievements but don't use them as a standard with which to measure your own. When you're envious of someone else's ghost hunting successes, you naturally want to undermine his reputation and the way others gravitate toward him. But in the long run, you're only undoing your own reputation. Salvation: Bury your envy and start focusing on building a reputation as a team player. Figure out how you can start turning your envy into passion or positive energy. More is not always better. Though everyone is anxious to get positive proof that will make others believe you that Ghosts are real, none of that will matter if you don't care who you plow through to get to the top. While it's definitely OK to ghost hunt responsibility, it's more important to maintain a balance. Salvation: One of the most critical mistakes regarding gluttony is not considering your team enough, Kusy and Holloway say. "You don't need to belittle and diminish someone else ghost photo or paranomal investigation tecniques or documentation to be noticed. 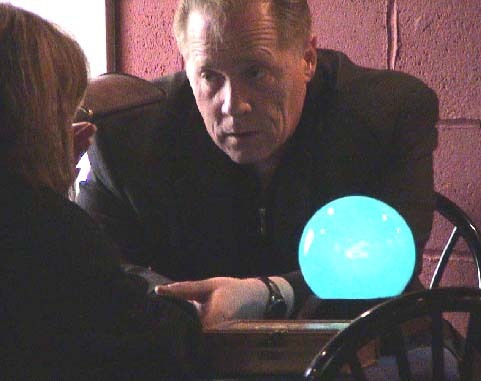 Work with your ghost hunting team so that you are all noticed for innovation and productivity and paranomal evidence. Make sure that you are in the lead of building a positive team climate; making everyone look good on a project will make you look good as a team player." Everyone is guilty of wanting more: more money, more power and more responsibility. The problem comes when you try to use your ghost hunting evidence to punish others, demand their loyalty or take all the credit for the work that others have done. Salvation: It's best to focus your goals on the long term. If you only concentrate on quick, short-term gains, you'll probably do well in the moment but you won't be able to extend yourself to the next level. Lust in the workplace isn't limited to a haunted cemetery romance. You might lust after a nicer prohibited haunted location or even do things you shouldn't. But, spending your time focused on what you don't have or others' paranomal work achievements rather than working to further your own is a sure-fire career killer. Salvation: "What length will you go satisfy this lust?" "If it extends to deceptions, badmouthing your fellowghost hunters or undermining the productivity of the team, then your emotions are ruling your actions with disastrous results. Go to your paranomal team leader and ask him or her to put you on a development plan that can segue you to that next new job in the organization." Personal success is your M.O. -- you have no problem taking credit for a great ghost photo, a EVP, EMf or Ghost video, even if it was a joint effort. You have the absolute belief that you're always right; you always want to be in control, and you think other people won't -- or can't -- do their jobs. While it's a good feeling to be right, no one is always right. "When you are right and make sure that everyone else knows that they are proven wrong, you can be sure that you have lost their support in the future," . Salvation: First, realize that building a reputation for getting things done right is to build a team that does it right together, they say. Remember that sharing credit with everyone who deserves it makes everyone accountable. Finally, give praise where it is due and you'll be shocked how much comes back to you, Kusy and Holloway say. If you're lazy, complacent or indifferent about your ghost hunting, you're on the express train to nowhere. Just because you've been successful in the past doesn't mean that success will carry you through the rest of your career. Sloth becomes toxic when there's a continued pattern that becomes counter-productive to workplace productivity. Salvation: There are several steps you can take to keep your laziness in check, Kusy and Holloway say. First, take stock of yourself and determine where the source of your laziness lies. Are you bored? Do you need to be more challenged in your role? Next, make a specific plan to increase your productivity at work. Figure out how you will measure your expectations and make sure it's feasible, they say. Anger and malice benefit no one at a haunted paranormal investigation location. Harboring secret hatred or angst toward your fellow ghost hunters, colleagues or general paranomal environment will only create an atmosphere of negativity and abuse around you. Salvation: Any pessimistic feelings you have toward co-ghost hunters or haunted location are bound to surface eventually. If you're angry with your home or personal life, figure out what is bothering you and then see if you can talk to somone about it. If you're unhappy with your ghost hunting experiencesin general, it might be time to start looking for a newhobby like hunting for real chupacbras.